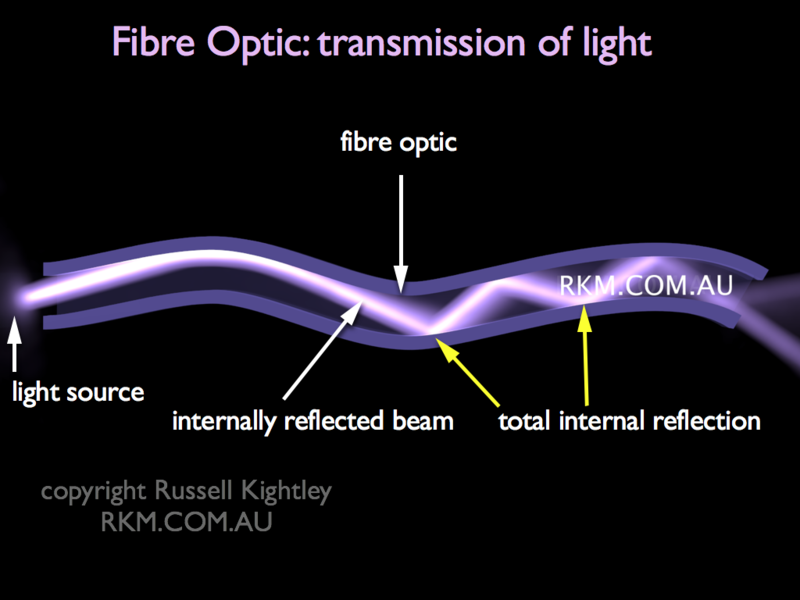 Animation of fibre optic transmission of light. The light source to the left beams light into the slender glass fibre. The light bounces off the interface of the glass and external layer as a result of total internal reflection. In this way, the light can follow the course of the fibre as it bends progressively through the animation. Effectively, the light can travel around corners. Huge amounts of information can be carried by such systems. See our Critical Angle Calculator. Because of their huge capacity to carry data, fibre optics are the method chosen for the Australian National Broadband Network. BUY THIS ANIMATION of an optical fibre!